Head coach Riley Wallace celebrated the start of the 2005-06 season with his 300th victory at the school. This season, the school celebrates Wallace's 20th season with the program he helped resurrect during the lean years of the mid-1980s. The winningest coach in the program's history, Wallace needs 19 more wins this season to become the winningest basketball coach in the 50th state. A 19th win will surpass former Rainbow Wahine coach Vince Goo's record of 334 from 1987-2004. Wallace has amassed a 316-252 (.556) record since becoming the program's 17th head coach in 1987. His 21-year career mark stands of 331-279 (.539), includes a two-year stint with his alma mater, Centenary. When Wallace took over the program in 1987, it had suffered through four-straight losing seasons, including a combined 11-43 mark during the latter two years. Since then, Wallace helped turn the program back into a conference contender with 15 winning seasons and nine trips to the postseason. Despite missing the postseason last season for the second consecutive year, his team still extended its school-record streak to seven consecutive winning campaigns. Still Wallace has guided the program to nine of its 12 all-time postseason appearances, including a school-record streak of four straight from 2001-04. The `Bows have appeared in the NCAA Tournament three times under Wallace and have been invited to the National Invitation Tournament (NIT) on six occasions. Prior to his arrival, the program had just one NCAA appearance and two trips to the NIT. Three years ago, the team advanced to the NIT quarterfinals and came within one win of reaching the semifinals at Madison Square Garden in New York City. It was the team's farthest finish under Wallace since the 1989-90 and 1997-98 squads accomplished that same feat. The team opened the tournament with one of the biggest wins in the program's history, an 85-74 upset of No. 25 Utah State in Logan, Utah. UH then defeated Nebraska before a soldout Stan Sheriff Center in the second round before succumbing to eventual NIT champion Michigan in Ann Arbor, Mich. Since 2000, the 'Bows have been among the top teams in the WAC. UH repeated as WAC Tournament champions in 2001 and '02, becoming just the fourth team in league history to do so. In addition, the 2002 squad was the first in UH history to win both the regular-season and tournament titles in the same year. The 'Bows' success over the years have garnered them national attention and rewarded them with 36 national or regional television appearances in the past six seasons. The team and its players have also been featured in numerous national publications, including Sports Illustrated, USA Today, and ESPN The Magazine. In addition to being the winningest coach, Wallace is the most tenured coach in the program's history. His 19 seasons at UH easily surpasses Eugene "Luke" Gill's 11-year term from 1930-41. Wallace also is the "Dean of WAC coaches" and trails only UTEP's Don Haskins (30) for the league record for most seasons. Of the program's 10 20-win seasons, Wallace coached five of them, including the two highest win totals in school history (25 in 1989-90 and 27 in 2001-02). Wallace has also turned the 'Bows into a feared opponent during the WAC Tournament as UH has appeared in five title games and owns 20 victories since 1984. In addition, all three of UH's titles occurred in its opponent's home state; 1994 in Salt Lake City, Utah (Brigham Young), and 2001 and 2002 in Tulsa, Okla. (Tulsa). Wallace's teams had earned the reputation of being competitive during the regular season, but struggling during tournament time. That all changed in the 2000-01 season when that team, seeded fifth, defied all odds and captured its first WAC Tournament title since 1994. The squad defeated the Nos. 4, 2, and 1 seeds, respectively, en route to its second WAC title. The following season, the team put together the best season in school history, winning a record 27 games and capturing both WAC championships. That team was awarded the No. 1 seed and won its three games by an average of 17 points. The 1993-94 squad may have been the biggest surprise WAC Tournament winner. The season started with three-straight blowout losses by an average margin of 42 points per game. They rebounded to finish fourth in the conference and upset top-seeded New Mexico and host BYU. Wallace has earned numerous awards, including WAC Coach of the Year in 1989, '97 and 2002. In addition, Wallace was named NABC District 13 Coach of the Year in 2002, the first time he was recognized nationally by his coaching peers. A native of Illinois, Wallace entered the coaching profession as an assistant to long-time UH head coach Larry Little at Litchfield (Ill.) High School. In addition to serving as a basketball assistant, Wallace headed the track program for three years (1964-67). But the dream of becoming a head coach at a Division I program lured Wallace back to his alma mater, Centenary, in Shreveport, La., to begin his college-coaching resume. After earning his master's degree in education from Illinois, he coached at Centenary for nine seasons under three different head coaches. During his stay, Wallace recruited former Boston Celtic center Robert Parish and helped the team to a national ranking. In 1976, Wallace assumed the dual role of athletics director and head coach, but after one-and-a-half seasons, he left to take the associate coaching position at Hawai`i under Little. He stayed from 1978-84 before taking a three-year leave to coach Seminole Junior College. Wallace compiled a 68-36 record at Seminole, including back-to-back 26-10 seasons. 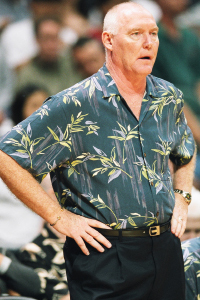 In May 1987, Wallace returned to Hawai`i and replaced Frank Arnold, who accumulated an 11-45 mark in two seasons. At Centenary, Wallace lettered in basketball for three years (1960-63) and was named team captain in his junior and senior seasons. He was selected the Most Valuable Player in the Gulf South Classic in 1962 and still ranks among Centenary's all-time leaders in scoring and rebounding. Wallace was born on Oct. 25, 1941, in Alton, Ill. He is a 1959 graduate of Jerseyville High School in Illinois. During the offseason, Wallace enjoys golfing and spending time with his wife, Joan. They have two children, Rob and Kim, and three grandchildren, Jackson Riley Haynes, Robert Riley Wallace III and Dominic Charles Wallace.